Incoming Secretary of State Mike Pompeo is giving conservative foreign policy lawmakers and activists new hope that he can help President Trump deliver on his tougher stance toward security threats in Latin America. The former congressman and CIA director's first test will come almost immediately after he arrives at Foggy Bottom next month. President Trump plans to attend the Summit of the Americas in Peru in mid-April and then head to Colombia to meet with the country's president, Juan Manuel Santos. Pompeo will likely be at Trump's side for many of the conclave's public events, as well as private bilateral meetings with key heads of state in the Western Hemisphere. 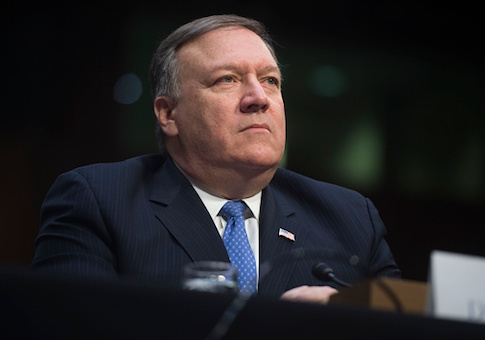 Together, Trump and Pompeo could demonstrate a strong resolve to continue confronting Venezuela and other violent and corrupt governments in the region, as well as to serve as reliable partners to dissidents and opposition forces fighting for democratic reforms. Trump will likely encounter negative regional press coverage over his attendance of the Summit. His stricter immigration policies, promise to build a border wall, and pledge to upend the North American Free Trade Agreement have stirred tensions in the region. A January Gallup poll found that only 16 percent of people surveyed in Latin America approved of Trump's job performance. A higher percentage—37 percent of those surveyed—approved of Trump's policies in Venezuela, where his administration's increased sanctions have ratcheted up pressure on the Maduro government. Last summer, Trump's remarks that he would not rule out a "military option" to stop the economic crisis and violent government crackdown on protesters rattled Venezuela's socialist leaders but had many conservatives in Washington applauding. With Pompeo at the foreign policy helm, GOP critics anticipate a dramatic pivot away from the "soft-power" leverage of the Obama administration, which led to a thaw with Cuba but did nothing to curb the Castro regime's influence in Venezuela or prevent the mysterious sonic attacks on U.S. personnel at the newly established U.S. embassy in Havana. In fact, some Republicans blame the Obama doctrine and its dependence on multilateralism for what they view as lost U.S. leadership and influence throughout Latin America. "I applaud the nomination of Mike Pompeo as U.S. Secretary of State," Sen. Marco Rubio, (R., Fla.), tweeted Wednesday. "I know he will have a firm hand against the Maduro and Castro regimes. Like me, Pompeo is a strong critic of these tyrants." Conservative foreign policy experts who embrace Trump's tough sanctions regime against Venezuela believe Pompeo will provide the institutional backbone the president needs to follow through on his threats and take a more aggressive approach confronting the Maduro regime and its connections to Hezbollah and bad actors worldwide. They point to former government officials' testimony that the Obama administration, out of a desire to strike a nuclear deal with Iran, shut down a U.S. task force that had tracked Hezbollah's criminal drug enterprise through allies in Venezuela, Syria, and Russia. Rubio also recently has pressed the Trump administration to follow up with the sanctions by demonstrating positive U.S. support for the Venezuelan people and democratic reforms with a multilateral reconstruction effort for Venezuela similar to the Marshall Plan. Additionally, over the last year, Trump has lacked diplomatic support for his warnings to Bogota over that country's spike in coca cultivation. The dramatic increase in Colombian coca has lead to record levels of U.S. cocaine consumption, and, critics argue, has undermined the achievements of Plan Colombia, the U.S.-led effort to stabilize the country with $10 billion in aid. Outgoing Secretary of State Rex Tillerson appeared to take his cues from career foreign service officers who played down conflicts and appeared content with gradual, window-dressing reforms and eschewed overt American intervention in internal Latin politics, critics said. "Despite holding the post for a year, Tillerson failed to recognize that senior career diplomat Tom Shannon was out of step with President Trump's marching orders to challenge the narco-sate in Venezuela," Roger Noriega, a foreign and defense policy analyst at the American Enterprise Institute, wrote in an essay published Wednesday. "Pompeo can reverse these shortcomings quickly by directing the State Department to cooperate with the efforts of Trump appointees in the National Security [Council] staff and in the Treasury Department to get tough on these South American hot spots." Noriega pointed to remarks Pompeo made earlier this year at an AEI event, where he explained his role in providing intelligence that produced a tougher Trump strategy On Venezuela. "The first or second set of sanctions that the administration put in place were enabled by the very intelligence we had delivered, and he had requested," Pompeo said. Jose Cardenas, who served in the State Department in the George W. Bush administration and now consults on Latin America issues, has argued that so-called Obama administration "holdover" personnel that remain at state, along with career bureaucrats have repeatedly undermined Trump's foreign policy agenda. "I think it all comes down to personnel," he said. "I think they're making progress in terms of the Western hemisphere policy team, slowly but surely getting into place. Once you have the political appointments in place, they are able to move the ball forward on some of the things the president laid out, but you're not going to get there as long as the policy is in the hands of the career bureaucracy." Others said they expected far less dissonance between Trump's stated rhetoric and State Department actions and appointments. Shannon is the undersecretary for political affairs and Tillerson's right-hand man. He served in a similar capacity during the Obama administration. Shannon recently announced his retirement, but his influence is still having an impact. Some Republicans on Capitol Hill blame Shannon for the nomination of Joseph Macmanus to be ambassador to Colombia, America's closest ally in the region. Macmanus is a 30-year career foreign-service officer who served as a top aide to former Secretary of State Hillary Clinton. Rubio pressed Macmanus last week during a confirmation hearing on his involvement in Clinton's immediate response to the attack on Benghazi. Rubio's line of questioning was aimed at trying to find out if Macmanus could or should have done more to push back against the initial Clinton and Obama administration claim that the attack was the result of a spontaneous reaction to an anti-Muslim film, not a premeditated terrorist attack that took planning and execution. Republican Sens. Ted Cruz of Texas and Mike Lee of Utah also have repeatedly voiced strong opposition to Macmanus' nomination and have pressed Trump to give the nomination to a political appointee, rather than a career State Department bureaucrat. "The Pompeo nomination gives conservatives hope [Macmanus] will be replaced by a political appointee who has business experience and deep knowledge of Colombia with a direct line to State Department and White House leadership," said a longtime expert on Latin American issues. This entry was posted in National Security and tagged Donald Trump, Mike Pompeo, Rex Tillerson. Bookmark the permalink.